Alpha Tech Energy Solutions India Pvt Ltd.
Alpha Tech Energy Solutions India is committed to make solar energy affordable through its technology innovation. Our products stand out in energy harvest, low sunlight performance, reliable operations, extended reliability testing, latest CE certifications besides MNRE certifications. 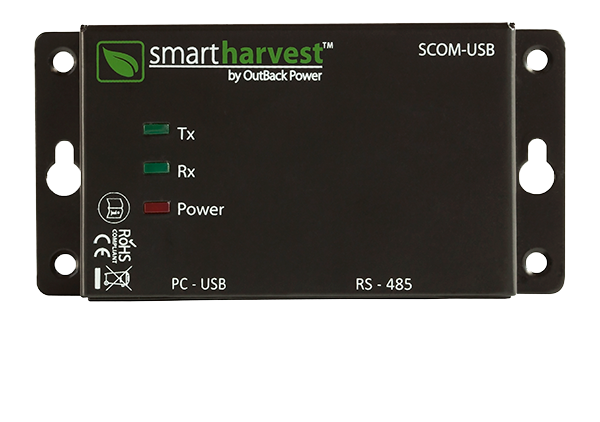 The PC-Remote Monitoring System (PC-RMS) is used to display, monitor, and configure the working parameters of SmartHarvest products. It is used to monitor connected devices to RS-485 bus. For SCCM series of products, PC-RMS enables the users to customize and configure a wide range of parameters. User can run this software in Microsoft Windows®, workstation or notebook. It is supported by custom communication hardware (SCOM-USB) to interface with the device to be monitored. Enables live data monitoring with a real time clock. Provides charge controller parameters in graphs and tables. Provides alert and indication for panel voltage, battery voltage, unit temperature, etc. Provides data table to view the parameters of charge controllers after every poll. Enables customization of the polling interval time from seconds to 1 hour. Enables configuration of battery settings, night light settings, identity settings, charging current for battery, and battery equalization charge for SCCM charge controllers. Enables to view the Exports logged data (.csv) in Microsoft Excel® or equivalent spread sheet application. Provides long term storage without memory limitation. Alpha Tech Energy Solutions India Private Limited is a Global company focused in design and manufacture of innovative solutions for Solar Energy generation and storage. Bringing the benefits of reliable renewable energy at lower costs, to meet the needs of installers and users across the world.